A United States Map as the Floridian Sees It. 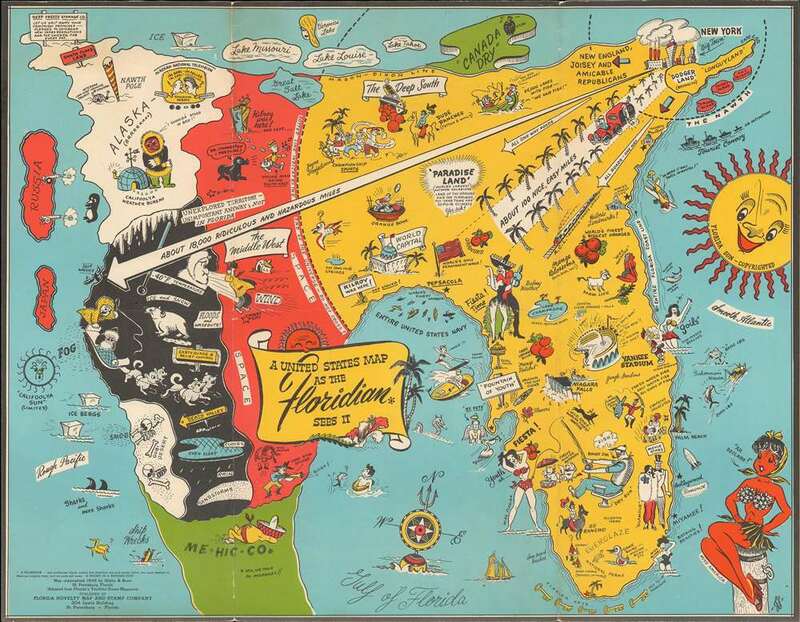 A humorous 1948 Jack Swenningsen map of the United States as seen from the perspective of a Floridian. No doubt inspired by Daniel K. Wallingford's c. 1930s maps, A Yorker's Idea … and A Bostonian's Idea…, this map presents an outsized Florida and pokes fun at provincial Floridian ideas about California, Canadas, Alaska, and he Midwest. Here Florida covers the entire Eastern portion of the United States. The Mason-Dixon Line divides not the North and the South, but the United States and Canada, known only for its signature soda, 'Canada Dry.'. The author plays with the connect between New York and Long Island and Florida, suggesting that it is just an easy 100 miles away. It also suggests that all roads to Florida are 'one way.' California, Alaska, Texas, and the mid-west are presented as a freezing wasteland. Florida itself is filled with all of the joys of the good life: sunshine, bathing beauties, oranges, Yankee Stadium, glamor, and of course, fishing. Two notes on the map read 'Kilroy was here' - doubtless a nod to Swenningsen's military service. The one in the Midwest bears the subtext 'and left', while the one in Florida reads, 'and stayed.' This references the tradition embraced by American servicemen during World War II of drawing a graffiti image of a bald man looking over a wall with the note, 'Kilroy Was Here.' An ad in Life noted that WWII-era servicemen were fond of claiming that 'whatever beach-head they stormed, they always found 'Kilroy' notices chalked up ahead of them.' It is said that when German forces founded the phrase on captured equipment, Hitler came to believe that it was the code name for a top-secret American spy cabal. Apparently, Stalin too found the phrase, graffitied onto the VIP bathroom at the 1945 Postdam Conference. Just who Kilroy was, if anyone, in uncertain, but some claim he was James J. Kilroy (1902 - 1962), an American shipyard inspector who jotted the phrase on ships he inspected. Others, perhaps inspiring its use on this map, believe it referred to Francis J. Kilroy Jr. a native of Everett Massachusetts, whose friend wrote the phrase 'Kilroy will be here next week' on a barracks wall in Boca Raton, Florida. It was later shortened and adopted by American servicemen around the world. This map was drawn by Jack Swenningsen and copyrighted in 1948 by Frank Glblin and Louis J. Boeri. It was published by the Florida Novelty Map and Stamp Company of St. Petersburg, Florida. The OCLC cites only a single example, in the collections of the University of South Carolina, but we are aware of additional examples in the Rumsey Collection at Stanford and at the Touchton Map Library in Tampa. This map is scarce to the market. Jack Swenningsen (1916 - June 3, 2017) was a Danish-American photographer, graphic artist, and accordionist, based in St. Petersburg, Florida. He was born in Denmark and immigrated to the United States as a young child. He grew up in New York City, graduating from Pratt with a degree in advertising and marrying Amelia Swenningsen shortly before World War II. During the war he served in the U.S. Army Infantry with whom he was stationed in northeastern Italy. Swenningsen and his family relocated to St. Petersburg Florida in 1948, immediately falling in love with the state. He is the designer of the 'Mer Sun" photo on the St. Petersburg Chamber of Commerce building. Swenningson died at the extreme old age of 102 in 2017. We are aware of only 1 map by Swenningsen, his pictorial map of the United States as seen by a Floridian. Good. Some wear on original fold lines. Trimmed to neatline, possibly by publisher. Rumsey 11406.000. Tampa Bay History Center, Touchton Map Library, M1504. OCLC 908695360.